↑ Accumulated additional 3,500 USD as part of my annual savings goal. Bought: Additional 16,400 Gazprom shares (GAZ:FRA) at $7.81 a share. Sold: my emerging mutual funds hold in the local currency. It has been a total debacle – investing $30,000 in 2008 and selling in 2013 for $20,000. #1 I did thing that I personally thought I would never do – spent my emergency fund. An opportunity presented itself – Gazprom (GAZ:FRA) and I was greedy. I went and bought some more shares – 16400 to be precise at 7.81 USD per share. 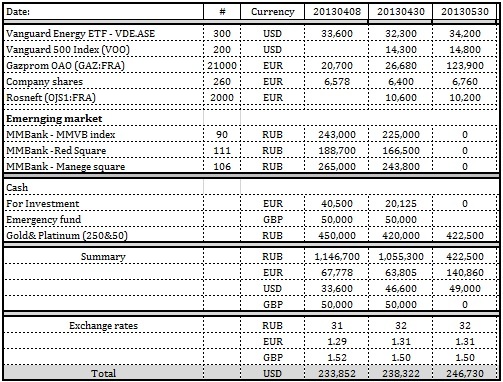 I used proceeds from the emerging market mutual funds (20,000 USD), money left for investment 29,500 USD and emergency fund 78,500 USD. It will take me next 22 months to re-build my emergency fund. At the moment I have no regrets, as only this year dividends are 4.6% at the price I paid for my shares.